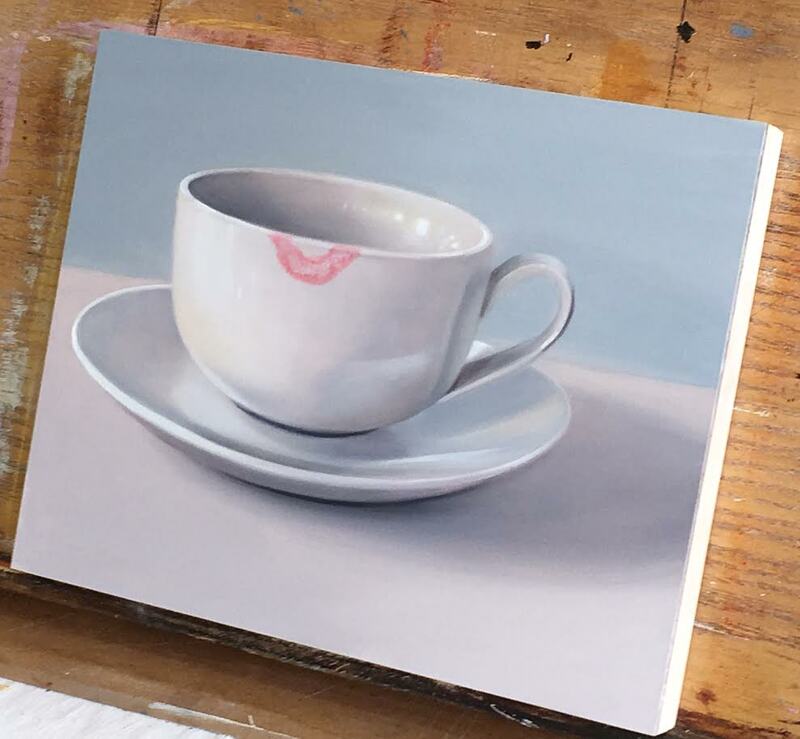 ...As much as it was tempting to simply pucker up and give my painting a big old smackerooni, the idea of spreading toxic oil paint on to my lips did not seem to me, the most sensible one! However pleased I have been with a painting, I have never yet felt the urge to actually SNOG one! I mean, that would just be plain weird, right? How is it that no matter what the crisis, we always reach for a teabag? What is it about a cup of tea that makes a disaster seem just a little more tolerable? ...It's one of life's great mysteries! I find a nice cold beer to be more effective, but each to their own! I confess to a mug of steaming tea per hour - addicted! I also confess to not using 'lippy'. 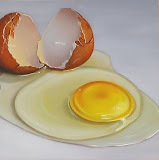 This painting is fabulous - painting glass is difficult (to others) but painting a white cup and saucer is brilliant (speaking as an oil-painter who has completed two now!)... the lipstick is a masterstroke ... you're a bloody genius. 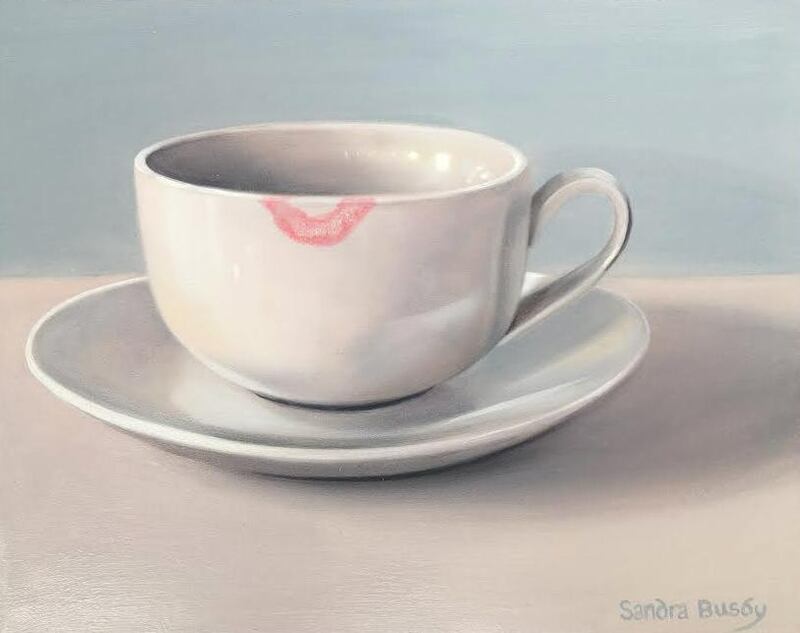 What a great painting, Sandra! The shades of colours in the 'white' cup are gorgeous! Tu as eu une riche idée que de la peindre ainsi. Celle-ci a une âme et j'aime beaucoup la douceur des nuances claires que tu as utilisées. Je viendrais bien prendre une tasse de thé avec toi ! J'espère bien qu'un jour cela puisse arriver ! Un grand merci pour ton gentil petit mot, il me touche beaucoup. Gros bisous et des "bizouilles" de Sir Icarus ! Sigh! I just fell in love with this the moment I saw it! It is saying so very much! Just perfect! 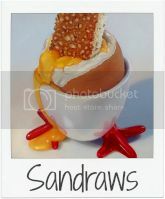 So very original, Sandra - great idea and brilliantly painted! I do admit that I never heard the term "snogging" before but surmise what it means from your painting and your post! Lol, really? How funny! It means a big hollywood style kiss!